A new Webchutney Report says that a significant percentage of people are turning to the web for health related information. Increasingly, CPG and Finance category clients with healthcare & lifestyle centered products are creating campaigns to engage the end consumer who is looking to change her lifestyle for the better and browsing for related information. Considering this, it obviously makes sense for Quaker Oats to have a deep online presence. It is, apparently, on a mission to make India Heart Healthy. They have a Website and a Facebook presence as well. I ‘like’ their Brand Page on Facebook (pun intended) which has about 150k fans. For one, the Wall Posts are not recycled content being pushed daily (that’s a major irritant!). At least for now, they have a new Oats recipe every other day (picked from their website content) and I find them interesting. 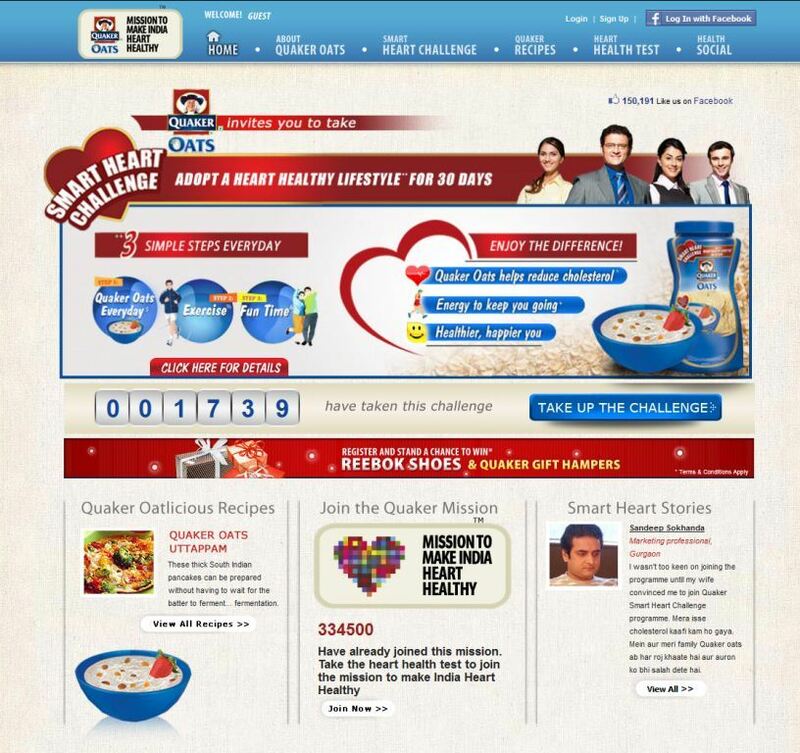 The new campaign is the Quaker Smart Heart Challenge – which is a 30 days, 3 step lifestyle change challenge for a Healthy Heart. You can sign up on the Facebook Application and it leads you to the website. Bug Sighting! One of my pet peeves is Facebook Brand page images which persistently ask me to like the page even after having done it. Quaker has devised an interactive Heart Health Test with Apollo Hospitals which puts up some questions, tells you the state of your heart basis your responses and offers customized advice for lifestyle changes etc. This is hosted on their website. The test is good but I feel could have been rendered better, visually.